Ben has written a lot about how much he relies on Uber when traveling. Unfortunately, Uber is no longer available in China as of last year. However, China has its own ride-hailing app, called Didi Chuxing, or “Didi” for short. We were in Xiamen during the National Holiday, and taxis were in high demand. When we wanted to go from our hotel to the ferry terminal (we were hoping to catch a ferry over to a neighboring island called Gulangyu, but when we got to the terminal the lines were insane), it seemed like the perfect opportunity to try Didi, as I had read that it’s available in English. I downloaded it, entered my credit card, and requested a ride. Also, when it was time to leave Xiamen, we used it to go from our hotel to the airport. Adding a card was easy, though I couldn’t get it to accept my Chase Sapphire Preferred card. Thankfully, my Citi Prestige card was accepted without an issue. 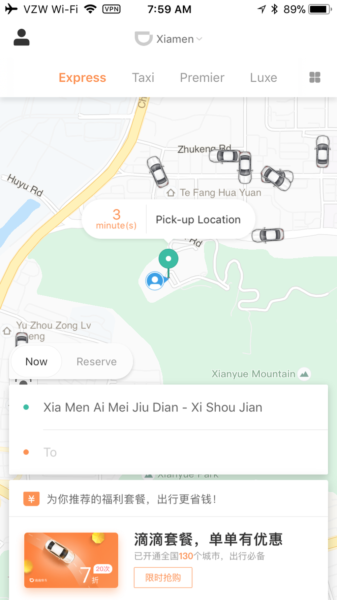 Didi’s interface will look fairly familiar to anyone who has used Uber or Lyft. It shows a map of your immediate area and some cars roaming around nearby. Like Uber, they have several options for levels of service, ranging from “Express” (similar to UberX in the U.S.) to “Luxe.” I chose “Express” because I am cheap frugal. You type in your origin and destination, and it gives you a fare estimate. Apparently within the “Express” level there is further segmentation. I chose “Select” as opposed to “General,” because it was only about 10 percent more. Within a few seconds, it paired us with a driver. I like that it tells you not only their rating but how many rides they’ve had. Then I received a couple of text messages, which had been automatically translated from Mandarin (and clearly it was not a perfect translation, which is fine, since the messages were kind of hilarious). For a minute I worried he was going to show up on a horse. I originally thought the driver had sent the messages, but the second time I used the app I received the exact same ones. 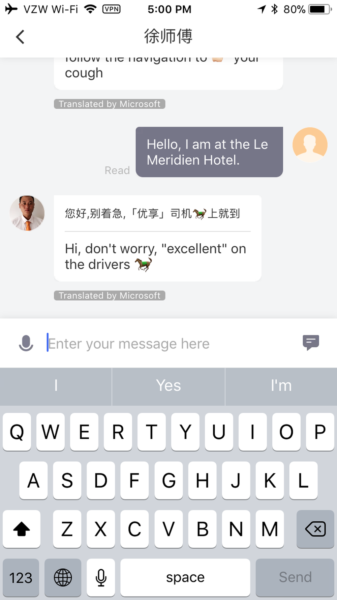 If you need to communicate with the driver, it gives you a few English options (which it will then translate into Mandarin). You can also write your own message, which will be automatically translated. Overall this experience was very similar to my general experience with Uber. On both of our Didi trips in Xiamen, the car was clean and the driver was friendly and competent. Although neither driver spoke much English (aside from “hello” and “thank you”), the app facilitated our communication. The price was about the same as taxi fare, and lower than the estimated fare it gave at the beginning of the trip. At the end of the trip, you have the option to rate the driver. 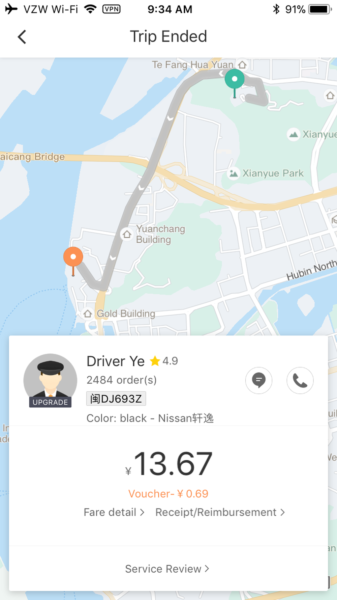 Unlike Uber, there was no option to give a gratuity (likely since tips are much rarer in China than they are in the U.S.). For both of the trips I took, I didn’t hesitate to give the drivers five stars. Uber Credit Card To Offer Airline Mileage Transfers?! Did you have to trick it to send you the SMS code to sign up? I change my country code then enter my phone number but never get a text message to sign up. 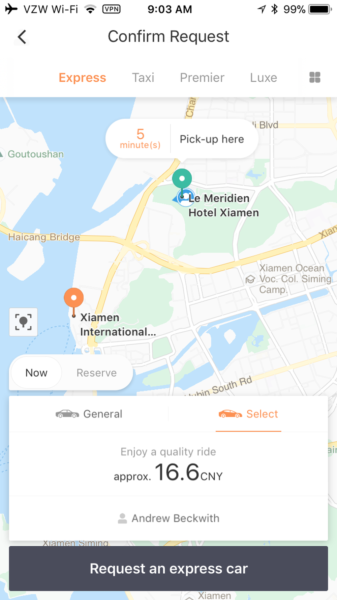 I think Uber is still available in China, but you have to download a special Uber app that is only available for use in China and is available in Chinese only (which didn’t seem to worth the effort anyways). I actually didn’t know that Didi has a English version – it’s definitely going to make tourists’ lives much easier. The horse emoji is a word play in Chinese – the original message says that the driver is going to arrive “very soon”, and here “very soon” in Chinese is “马上“, which can be literally translated to English as “on the horse”. I used DiDi a few weeks ago , that is until the payment system stopped accepting any of my cards and left me stranded ! When it works it’s great but be careful. Do you have problems with international/US credit card? I tried using my Chase Sapphire Reserve a few weeks ago and it didn’t go through. I just called a regular cab. I had trouble adding my Visa Chase SReserve — the issue was a “verified by Visa” problem. So I had to call Chase, ask them to transfer me to verified by Visa, and then verified by Via removed the block and I was able to add my CSR. I used Didi in Shanghai around the same time. Ran into the same issue adding Chase Sapphire but my Chase Hyatt added fine (but my Sapphire worked for purchases at shops). I found it easy to use and very inexpensive even for the Luxe option (I didn’t noticed a huge difference but the driver was a bit more professional). Highly recommend using Didi in China! @usr22 The “special” version of Uber simply uses Didi on the backend. The only thing Uber about it is the app’s branding. @Chris M Seems like they got a Nissan for the ride to the hotel, and the Corolla is the ride to the airport. Anyone Chinese care to give proper translations of what the app is trying to say? Did you have a Chinese mobile phone? It does not seem to accept us phones for registration. Your last name is Beckwith???? Did it charge a fee for using a foreign credit card? My wife is going to Shanghai next week and I am trying to convince her to get didi on her phone. @Kevin I don’t see any additional fee on my credit card statement, and I earn 3x on my Chase Sapphire Reserve card. For those who are asking, I used my regular American iPhone, and downloaded the app through the App Store. It worked fine, and I didn’t need to receive a code via SMS. I used a card with no foreign transaction fees, and as far as I know the app didn’t charge me anything extra for using a non-Chinese card. As I said, I had problems with my Chase Sapphire Preferred (a Visa), but my Citi Prestige (a MasterCard) worked fine. I can’t get my Chase Sapphire Reserve card on that thing. Mine telling me how you did it? It took my Amex though. I used it 2 weeks ago in Beijing, and I had my AmEx Plat linked to it. I had to verify my US phone number via SMS. One thing you left out (or it happened to me and not you) — when you finish the ride, you have to press a button on the app to pay the driver, so be sure to do that before you get out. The reason is that you can also pay them cash I think, so the driver wants to know he got paid some way or another. That’s different from Uber so I wanted to point that out. No free ride credit for signing up? Did they burn through venture capital money? Thanks for this article. I’m on a train heading to Chengdu and Google maps has finally stopped working so I can’t figure out my route to the hostel. I’ll be using didi now.